Ghajn Tuffieha is an area in the north west coastline at the end of the fertile valley which extends for five kilometres from St. Paul's Bay. 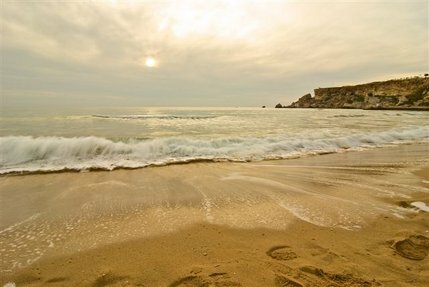 A small headland splits the sea in the middle to create two fairly large sandy beaches, viz Golden Sands and Ghajn Tuffieha Bay. 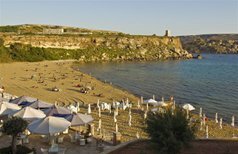 GOLDEN SANDS is the most frequented beach next to Mellieha Bay. Its large stretch of tawny sand attracts thousands in search of company, sea and sun. The big, modern hotel towering over the bay has a small beach concession from which it provides facilities for sunbathing and for aquatic sports. The bay is a favourite spot for barbecue parties during moonlit nights. The second beach, GHAJN TUFFIEHA BAY, lies down a slope and can only be reached by a flight of steps. A 17th century watch- tower overlooks the bay. Because of its isolated position, this bay is not usually as crowded as nearby Golden Sands. However, its fine sand and its rustic surroundings make it more alluring to those whose main interest is the soft sand and the clear sea-water. A note of caution will not be out of place here. On a few days, when the north west wind blows at a certain force, strong currents may occur in the deeper parts of the two sister bays. On such occasions, a red flag is hoisted on the nearby tower to warn that bathing should be limited to the shallow-water reaches of the two bays.